Rabbi Shishler online: Lessons from the World Cup part I- "It's never gonna happen"
Lessons from the World Cup part I- "It's never gonna happen"
South Africa is one big party these days. I had to complain to the electricity company the other day, and the operator was unusually effervescent and couldn't help chatting about the soccer while he was processing my complaint. Wherever you go- the malls, on the street, the airport- people smile, joke and toot their vuvuzelas. Even the notoriously aggressive taxi drivers are jubilant. People use expressions like "rebirth of our country" and "crossing the racial divide". It is nothing short of miraculous. 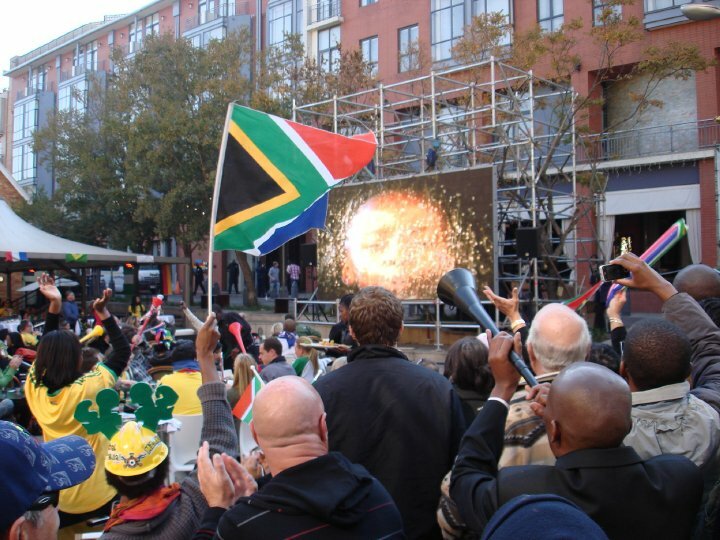 Upon reflection, few people were optimistic about SA's readiness to host the World Cup. Cynics sneered that we'd never have the stadiums, roads or hotels ready in time (striking builders almost proved them right). Doomsayers predicted that our disorganised airports, lack of public transport and crime-epidemic would surely scare off potential tourists. Table talk was peppered with dire predictions against a chorus of "it's never gonna happen". Everyone "knew" about FIFA's backup plan to move the tournament to Oz when Africa would fluff its first shot at hosting this spectacular sporting fest. South Africa defied the skeptics. As H-hour approached, the stadiums took shape, roadworks wrapped up, hotels installed furniture as they laid paving and even the Guatrain came online. We tentatively allowed ourselves to hope- maybe we could pull this thing off after all. Still, the doubts persisted, clouding our optimism. We've been let down as a nation so many times that we battle to be positive. We've missed a good number of opportunities in the past, how could we be sure we wouldn't wreck this one too? All that changed in an instant. Doubt evaporated in an explosion of sound and colour at 12p.m. on Wednesday, 9th June. Hundreds of thousands of black and white South Africans united in Sandton, Soweto and Cape Town to show support for their B-rated national soccer side. People danced in the streets, vuvuzela'd and toyi-toyed, grinned and embraced. Our impossible moment had arrived, sparking an unstoppable celebration that still continues. It's been over 2000 years that we Jews have been waiting for our "Impossible moment", for the better world that our prophets and sages promised. But, we're skeptical. It's been so long and we've been let down so many times. We "know" that life will plod along, blighted with antisemitism and a growing Jewish apathy. Moshiach would never actually come. World Cup 2010 reminded me that everything can go right in a nanosecond. It showed how it's human nature to doubt that change will come, even when the signs are there. Watching my neighbourhood erupt into exuberance was a foretaste of that wonderful moment that will come out of the blue and transform all of us in a flash from uncertainty to unbridled joy. May it come very soon!